Google is now stocking car docks for its Nexus One 'superphone', utilising the phone's turn-by-turn navigation to turn it into a sat nav. Although the Nexus One has yet to go on sale in the UK, Google is keen to push the benefits of its HTC built smartphone. The Nexus One: Car Dock has built in speakers and volume controls to add a little volume and control to the driver and comes with the Car Home app which loads automatically. 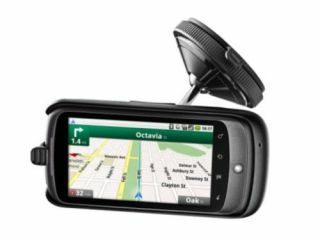 "The Nexus One Car Dock is the perfect place to put your phone when you're in the car," says Google's Nexus One page. "In addition to holding your Nexus One, the car dock also charges your phone's battery, lets you use your phone handsfree, and provides easier access to voice and navigation apps." Of course, turn-by-turn navigation is not yet available on Google Maps in the UK, so this is by no means as essential a purchase over here – but it does seem likely that the functionality will arrive at some point soon.